Giving a superior performance requires good planning, commitment, hard work — and instruments that sound good and play in tune. Getting better instruments in the band isn't hard, but it does require a plan and some effort. 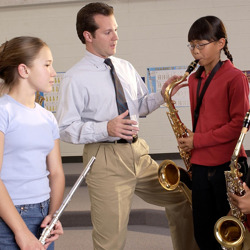 Band members and their parents must be shown the difference better instruments can make to the student and the band. The instruments must be made available to them on an attractive plan (including generous rental credit, fair trade-in amounts, and easy payment terms). And finally, there must be an organized program that builds excitement, inspires confidence, and encourages action. The Amro Step-up Program is a tried and proven method that includes all of these things. Does the Amro Step-Up Program Work? Why not ask some of your fellow band directors? Amro has been helping bands and students in Mid-South schools get better instruments for many years. As your step-up program becomes an accepted and expected annual event, better instruments increase and eventually become the accepted standard. It's not really hard to get better instruments in your band. Your Amro rep can arrange it. Give us a call and give your band the advantage of better instruments!